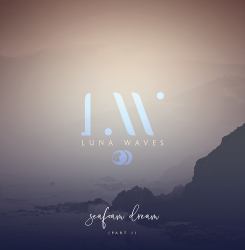 Luna Waves is the moniker adopted by singer-songwriter and multi-instrumentalist extraordinaire, Rob Muir and the first part of his two album release ‘Seafoam Dream’ is due for release at the end of this month, with the second part following in early 2019. Drawing inspiration from a wide range of sources and genres from the musician who admits to being heavily influenced by some of the greats of the 80’s and 90’s as well as some more modern references, Luna Waves debut LP is something of a musical tapestry woven together with different sounds, instruments and styles to create its own original identity. In the first track and aptly titled, ‘Luna Waves’ there is a certain cinematic feel to the entirely instrumental song, which both sets the expectation for the quality in the craft of the songwriting but also for the tone of the record. The song, and subsequently the album as a whole, stay true to the title and have a certain ethereal, dreamy quality deserving to be listened to late at night, with headphones on to truly appreciate the work that has gone into the atmospheric sounds on offer here. Following the opener, is lead single ‘Mystery Loves Company’ which has a very 80’s feel with its synth lead and guitar effects and the introduction of Muir’s vocals, which in turn, have an 80’s feel utilising reverb to capture the era and with an infectious chorus, it’s clear why this was chosen to introduce the album. Other standout tracks include the brooding piano ballad of ‘Missing Pearls’ with Muir accompanied by some female harmonies throughout, ‘Souled Out’, an upbeat, Pearl Jam-esque rock song which again really picks up in the chorus which gives an already interesting record another dimension and personal album highlight ‘Tumbleweeds’ which is reminiscent of a 90’s pop song which keeps things simple with a guitar, bass, keyboards and drums set up and whilst maintaining the echoey, dreamy textures of the record as a whole and brought to life with a straightforward yet heartfelt vocal delivery. Going into the record, Muir had written 30+ songs for the project which is why the record has been split into two halves and after hearing what is on offer on the first part, in terms of both quality and diversity, Rob Muir could soon find himself regarded as one of the leading homegrown talents. A brilliant debut overall and an exciting indication of what is to come from someone so early into their career especially as there is already a part 2 and an instrumental EP in the works.